With the recent passings of Stan Musial and Earl Weaver reminding us of our own mortality, Earl Williams’ death of leukemia on January 28th, 2013 went largely unnoticed. He was 64. Amazingly, Williams and Winkles survived the 1977 season. The following spring, Williams broke his thumb. 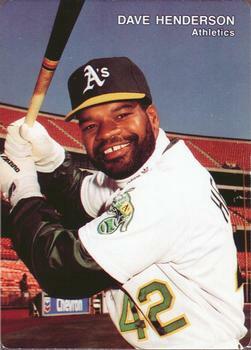 And then, just before the start of the regular season, the A’s placed Williams on waivers. None of the other 25 teams showed interest in the veteran catcher/first baseman/DH. Given that he was only 29 and still healthy enough to catch, Williams was shocked. So Williams, with the help of his mother, did something unprecedented for an out-of-work ballplayer. They took out an ad in The New York Times, offering his services to any major league team that might be looking for help. The part about having no police record underscored Williams’ sense of humor. But would anyone take the ad seriously? According to The Sporting News, one major league team did show interest. Desperate for a third-string catcher, the Expos sent Williams three wires (in the days before e-mail) and even left a phone message at his mother’s house. When Williams did not respond (for reasons that remain unknown), the Expos signed veteran Ed Herrmann instead. Still, Williams didn’t quit. He ended up signing a contract to play in the Mexican League. He put in two seasons in Mexico before receiving an invitation from the Pirates to attend spring training in 1981. The Pirates seemed interested in having him as a backup catcher/first baseman, but he failed to make the team and rejected an opportunity to play for their Triple-A affiliate, the Portland Beavers. Williams opted to end his playing career. I had not heard much about Williams since then, until reading a note on Facebook that he had passed away after being diagnosed with leukemia in July. Like many other fans, I was saddened to hear that he had died relatively young.